The inverted hammer is a single candle pattern that appears at the bottom of a downtrend. There is a long upper shadow, which should be at least twice the length of the real body. The longer the upper shadow, the higher the potential of a reversal occurring. The color of the small body is not important but the white body has more bullish indications than a black body. There is no or hardly any lower shadow. It is considered one of the 12 major signals. 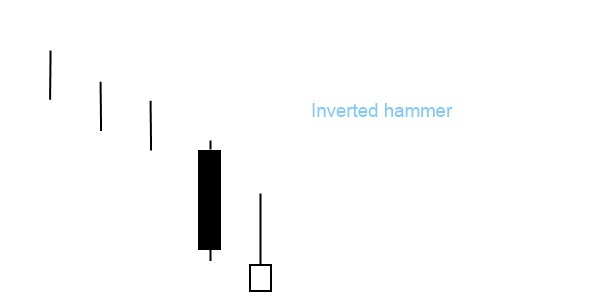 The inverted hammer candlestick pattern is the reverse of the hammer pattern. It is quite similar in shape to the shooting star pattern, they both have one candle and the open, close, and low are near the low of the pattern. But unlike the shooting star, the inverted hammer appears in a downtrend and forecasts a bullish reversal.